The T110E4 is an American tier 10 turreted tank destroyer. The T110E4 is the tier X turreted American Tank Destroyer. The E4 features an armored turret with a strong mantlet, but many weakspots and low gun depression limit the E4's hull-down potential. This tank also has much improved frontal armor on par with the T110E5. However the sides and rear armor are still incredibly weak, so make sure to keep the front towards the enemy at all times to reduce damage taken. The upgraded 155mm cannon has a lower rate of fire to balance having a rotating turret so you must stay in the line of support. 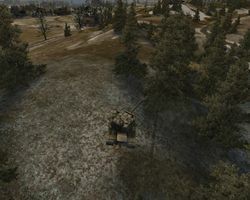 Because of the nature of the design, which was finalized by Wargaming, the turret can only rotate 90 degrees to the left or right so this tank is still vulnerable to flanking to some degree. Still, the upgrade to overall armor protection and the boost to penetration and fire rate can make this tank a serious threat to anyone who happens to face it. The T110E4 marks the end of its American tank destroyer line. Good alpha damage and increased penetration over the T30's 155mm variant. Decent mobility and top speed. Very large weakspots on turret and hull. Gun mantlet its only 254mm of armor. Mediocre -6 degrees of gun depression also limits hulldown tactics. Weak sides below the tracks and lowglacis, and a large rear engine mount are easily penetrated. Unreliable at sidescraping. The ammo rack is very weak, and gets damaged often when hit. 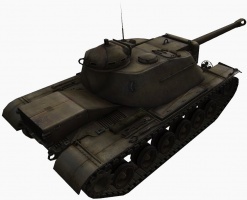 The T110E4 is everything players wished the T30 could be on maps with flat ground, but their play styles are totally different: T30 has strong turret with -10° of gun depression, a decent side hull, but bad frontal hull armor that means is perfect for play it in hull down and sidescraping positions; The T110E4 trades armor on the turret and gun depression in favor of a thicker frontal hull that can be used to bait shoots on corners; so don´t try to play like a T30 or you will go back to the garage really soon. The good news is your improved firepower in your gun: all kind of shells have a huge armor penetration and big alpha damage, allowing you to penetrate almost everything in front of you. However, the price of this power is the terrible gun handling, low dpm and the poor gun angles mentioned before. With all these characteristics the T110E4 is half tank destroyer/ half heavy tank: not really good as tank destroyer as well as a heavy tank, it´s just a mix, so its play style depends strongly on the maps wich is played. In the open maps, it´s better to play like a sniper support (your armor at long range works well, the only problem is your gun handling) while in close combats it´s better to play like a heavy support. Remember, you are a support tank, enemies will flank and destroy you easily if you try to fight alone. 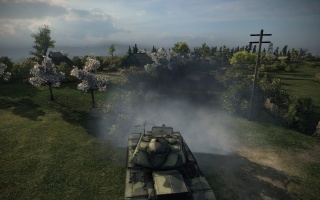 The best way to play T110E4 is in corners, baiting shoots with its good upper hull armor. Sidescraping may work with some adjustments: you have a lot of weak spots and your turret can´t sustain well the enemy fire because is flat, so you've to be very carefully and dont over expose them. This tank its really unfun and frustrating to play, but if you are smart, the T110E4 can be a versatile and rewarding machine. 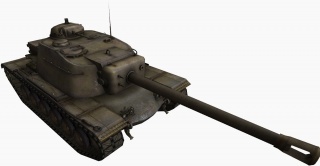 Initiated on December 3, 1954, the T110 120mm heavy tank project began (Estes). Prior work had begun on October 30 for cannons to be used in this project, the T204 and T179, 120mm cannons. On September 18, 1956 the project would be canceled in light of the success of the T43 project which would lead to the M103 (Estes). The T110 began life as concept TS-31 and was given to Chrysler Corporation with their proposal being the 120mm gun tank T110 (Hunnicutt). 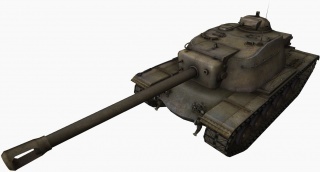 There were multiple versions of the T110 that were proposed. The initial proposal was rejected as its dimensions would of prohibited the vehicles passage through the Berne International Tunnel, a requirement for the project (Hunnicutt). A further requirement was that the vehicle have a 50 ton weight limit (Hunnicutt). As design progressed the T123E1 was selected as the cannon (Hunnicutt). In total there were five T110 designs (Hunnicutt). The names Chrysler and Detroit Arsenal should be considered interchangeable when reading on the development of this tank. To be clear the Detroit Arsenal, or Detroit Arsenal Tank Plant (DATP) was established by Chrysler but owned and by the United States government and alternately would be Army operated or contractor operated (“Detroit Arsenal Tank Plant”). Chrysler operated the facility during the development of the T110; having regained it from the Army in 1952 (“Detroit Arsenal Tank Plant”). The fourth Chrysler T110 proposal (T110E4 in game) on the right, next to the second Detroit proposal on the left. A model of the T110E4 on the left and a T110E4 drawing on the right. The only proposed armament was a 120mm gun, the same as the one on the T110E5. 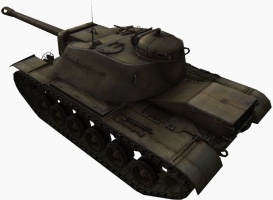 The armor is considerably thicker than listed in the blueprints for the T110E4. The T110E4 did not have a fully traversible turret. The tank's model is considerably different from the historical blueprint as a result, not having a protruding power pack and a gimbal ring gun mount, similar to what the T110E3 and the SU-85 have. The AOI-1490 engine had 700 horsepower historically, but in game it has 875 horsepower. This page was last modified on 5 December 2018, at 01:03. This page has been accessed 427,889 times.